There’s a lot I could focus on and delve into about A Quiet Place. Discussion has popped up about the reliance on American Sign Language and subtitles in a “mainstream” movie and how no one is objecting to reading dialogue, something people who are deaf or hard of hearing are championing to make a standard practice.1 I could also focus on how this lack of spoken word transforms ambient sound and the soundtrack into a 95-minute cliffhanger — you are always waiting for the next thing to happen because the lack of “sound” leaves you in a state of unease, compared to the jam-packed ear-busting blockbusters where there’s an explosion every other scene. There’s also the characters, the apocalyptic world A Quiet Place takes place in, or how well this works as a horror film. But instead I’m going to focus on the major criticism I have about A Quiet Place and how little it actually impacted my viewing experience. I am the moviegoer with the incredibly high bar for suspension of disbelief. Physics, logic, and many other categories or details I would gladly nitpick (and still do even if I choose to ignore them) really go out the window when I watch a movie. Unless a movie is bad for other reasons, I tend to give any film a lot of leeway and benefit of the doubt to tell the story they’re trying to. This contrasts to many of my friends and family who are taken out of a film and distracted by nitpick (however valid a nitpick) points. A Quiet Place for me is a textbook example of why I tend to overlook minor story errors. Besides the premise of a world where you must remain quiet to avoid detection by monsters, the main driving force of the film is Evelyn Abbott (Emily Blunt) is pregnant and will deliver a baby in a world where silence is life. So, shocker, there’s going to be some challenges. The labor and childbirth itself is a problem, but then also what to do after the baby is born. After all, babies are noise machines that cry, knock things over, and are all-around not ideal for a quiet place. This is all well and good; a perfect premise if you ask me for how these characters will learn and adapt to this challenge they are faced with… until it’s revealed the baby was conceived a good couple months after these monsters arrive on Earth. In fact, Lee (John Krasinski) and Evelyn conceive this child after losing their youngest kid to one of the monsters. People have needs, and people would also need to continue having children for the human race to survive — so adaptations would need to be made at some point in this world of sound-sensitive monsters. But I’m calling BS on the Abbotts needing, or rather wanting to have a child so soon after these monsters arrive and especially so soon after losing a child to one. So, where does that leave me? Mr. Suspension-of-disbelief has a glaring problem with a main premise of the story, it’ll just distract me and I won’t be able to enjoy the film. Wrong. 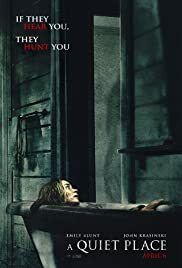 Even though I would consider this story flaw a major problem of the film, one that did pop up in my thoughts several times throughout the course of the film, A Quiet Place executed every other part of the film so well, it distracted me from my distraction. Krasinski does a phenomenal job with the character development and world building, doling out morsels of information vital to understanding A Quiet Place at exactly the right times. As alluded to previously, the sound also plays an important role in being an unrelenting force that requires you to keep your guard up at all times. There is no time for a relaxing breather — save for perhaps the scene at the waterfall with Lee and his son Marcus (Noah Jupe). Even though I kept coming back to, “Who in their right mind would want to have a baby in this world,” it continued to take a back seat to whatever was happening at that specific moment. And to the filmmakers credit, the solution for how the Abbotts would deal with childbirth in this world was indeed, extremely well-thought out — that is except for the whole part of why they were having the baby to begin with. Despite this pervasive story criticism, A Quiet Place is an exceedingly amazing and innovative film. Krasinski (for which this is not his directorial debut, as I originally thought it was) weaves all the pieces together in a satisfying and intriguing way, all while distracting me from the negative parts of the film. It’s one that you should see in theaters if you’re able — even for the horror-averse as I often am, A Quiet Place is an entertaining film packed with scares and cringe-worthy moments.